If you’re an Auburn fan and you’re on Facebook, you’ve probably seen it — more than half a million people have. 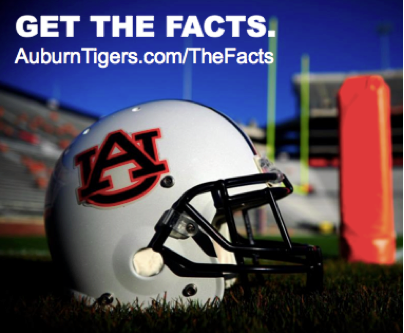 The sponsored post (“Get The Facts”) directing Facebook users to the Auburn Athletic Department’s bullet-pointed rebuttal of the claims made in a recent ESPN The Magazine story reporting a so-called “epidemic” of synthetic marijuana use among Auburn football players marks the first time Auburn’s Athletic Department has paid to promote a message on Facebook, and it’s been worth it. As of noon Monday, the post had been shared more than 2,400 times and had been Liked more than 7,500 times, which has put the link to the page in front of more than 620,000 people and set a social media record for Auburn Athletics in terms of exposure, according to Cassie Arner, Auburn’s Assistant Athletic Director for Public Relations. The proactive efforts on Facebook are being seen by some as the Athletic Department going on the offensive for the first time in the social media era in terms of protecting its image from allegations of impropriety. 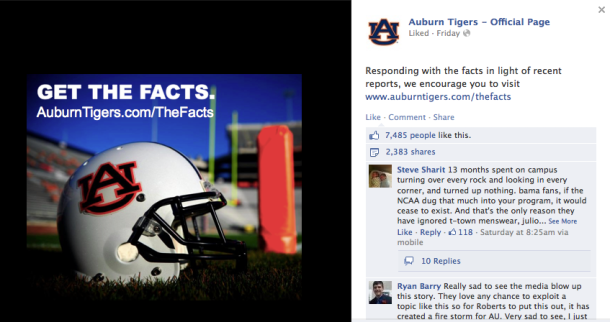 “We just really wanted to make sure what we were putting out there as a rebuttal to these stories was going to be seen by people,” Arner says regarding the Facebook post, which was targeted to users who mentioned “Auburn” in their profile, including those who had not yet “Liked” Auburn Athletics’ official Facebook page. Just not as much time as they had anticipated. But they were ready. Auburn has recently retooled its approach to online fan engagement—longtime Birmingham News beat reporter Charles Goldberg now covers Auburn for Auburn, frequently posting his stories to official Auburn Football Facebook page—”in response to Jay Jacobs’ directive that we do a better job of telling our story,” says Jack Smith, Auburn’s Director of Strategic Communication, who on Friday (in what has to be an Auburn land speed record in terms of granting of Freedom of Information Act request) released Selena Robert’s emailed request for an interview with Jay Jacobs along with a short but strongly-worded denouncement of Roberts’ journalistic tactics. Related: ESPN to carry final rolling of Toomer’s Oaks live, will possibly cover trees’ removal. Glad to see we’re going on the offensive. I get so tired of having to defend Auburn on my favorite Georgia Southern boards when everyone acts like it’s no big surprise when any negative story comes out about Auburn.